Here is are two authentic sauces to make a great tasting Som Tum (green papaya salad). These take all of the guesswork out of making som tum, as you just need to add this to your green papaya for an instant som tum. 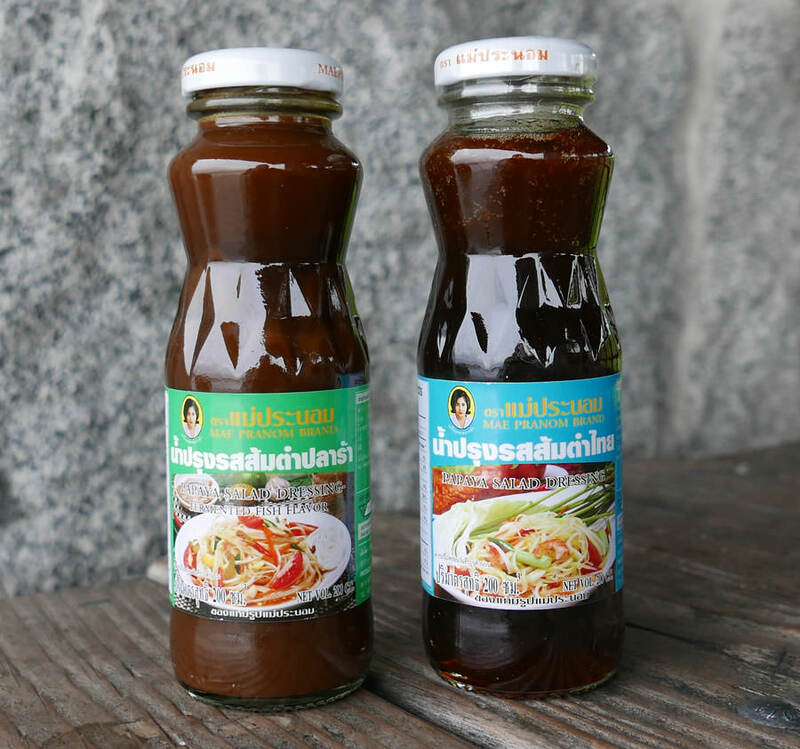 The "Fermented Fish" version (green label) is, according to the Thai staff at ImportFood.com, only for Thai people (non-Thai will not like it!). We believe there must be some non-Thai people who can enjoy it? It is very smelly, and the taste is "Super Real". This is as authentic Thai as it gets, and no doubt a true flavor that your local restaurant will not likely serve. The fermented fish used in this sauce is called "pla ra", a northeastern relish made by fermenting fish with salt and roasted rice. If you know anyone from NE Thailand then they will likely love this sauce if only because the unmistakale aroma will bring fond memories of home. Buy a bottle of this as a gift and you'll make someone happy. A lot of people in Thailand do not like pla ra in their somtum, so Mae Pranom has a non-stinky version as well. The blue label version more mainstream som tum salad dressing that is equally authentic and delicious. Packed in a beautiful glass bottle with attractive label, Mae Pranom is a very large producer employing the highest quality standard. Ingredients / Green Label: fermented fish 50%, fish sauce 30%, sugar 10%, shrimp paste 5%, salt 5%. No artificial color, no msg, no preservatives. Product of Thailand. Ingredients / Blue Label: fish sauce 60%, sugar 20%, tamarind 10%, distilled vinegar 5%, lime powder 5%. No artificial color, no msg, no preservatives. Product of Thailand.